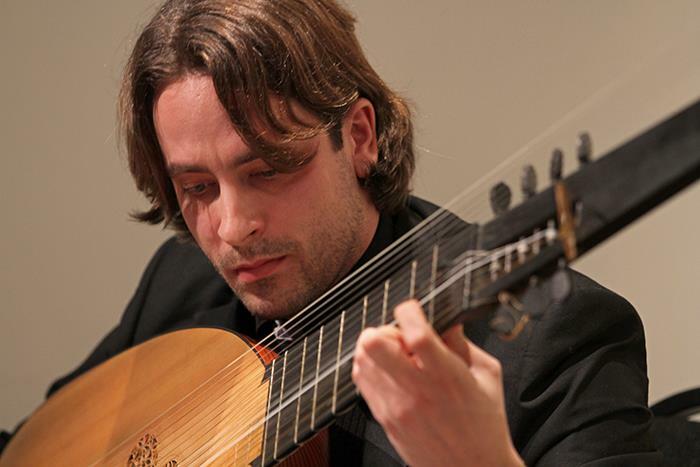 Francesco Tomasi started his musical very early, commencing with the classical guitar. When he was thirteen he decided to dedicate his complete attention to the lute, studying with Marco Pesci and Andrea Damiani. He brilliantly finished his studies at the Conservatorio di Musica “S. Cecilia” in Rome in 2009 getting the maximum marks. In 2012 he completed a specialized Master in lute, theorbo and baroque guitar with Rolf Lislevand at the Musik Hochschule of Trossingen. He has also attended many international master classes run by Paul O’Dette, Jakob Lindberg and Nigel North. He has a busy concert career, thanks to collaborations with various early music ensembles including “Concerto Romano” conducted by M° Alessandro Quarta, “Arte musica” directed by Francesco Cera, “Swiss Baroque Soloists”, “Pera ensemble “,”Cappella Gabetta” ,”La Malaspina”,” La Selva “,” Cappella Tiberina”,”Ricercare Antico”,”Anfione ensemble” directed by Andrea Damiani. He has performed in the most prestigious festivals and music seasons in Italy and abroad, including Tager Alte Musik in Herne (Germany), Wiener Konzerthaus (Austria), Internationale Barocktage Stift Melk (Austria), Kloster Malgartner Konzerte (Germany), International Festival W. A. Mozart Rovereto, Rheingau Musik Festival (Germany), “Festival Flatus” Sion (Switzerland), Festival Internaziona di Musica Antica di Urbino, Antiqua Festival (Spain), Roma Festival Barocco, with great success and appreciation by critics. In 2009 he took part in the event “Ponti Sonori” organized by the Accademia Nazionale Santa Cecilia. In 2010 he won the audition of the European Union Baroque Orchestra (EUBO), with which he has played concerts in various European countries including Luxembourg, France, Portugal, Germany, Poland, Belgium and with which he still collaborates. In 2010 he won, with his ensemble “La Malaspina”, the jury prize at the early music competition “Biagio Marini” in Neuburg an der Donau (Germany). When he was very young he had already the fortune and honor to play in many of the most famous concert halls of Europe including the Konzerthaus in Vienna, Casa da Musica in Porto, Herkuleszaal of Monaco (Germany), Auditorium of Santa Cecilia in Rome, Opera House of Ukraine, Kiev Philharmonie, Philharmonic Concert Hall of Lodz (Poland). In 2009, he worked with the ensemble “La Selva”, recording a CD entitled “Alla Luna” with music of Biagio Marini. With the group “Cappella Tiberina” he recorded for the label “Brilliant Classics” the twelve Concertos for flute of Mancini, with the group “Concerto Romano” he recorded the CD “ Luther in Rom” for the label Christophorus. He has also done many radio recordings for Vatican Radio, German radio WDR, ORF Austrian radio and television recordings ​​for the network RAI International. His ongoing commitment to the study of early music performance, sees him currently active as a continuo player, accompanying singers and instrumentalists of fame and emerging ones, as well as a solo performer, playing the lute, theorbo and Spanish guitar.